Five-time Balloon d’Or winner, Cristiano Ronaldo is replica of sprint icon Usain Bolt and tennis super star, Roger Federer, according to his Juventus teammate, Giorgio Chiellini. Ronaldo has so far punched his weight in the Italian Series A this scoring 18 goals in 23 matches. 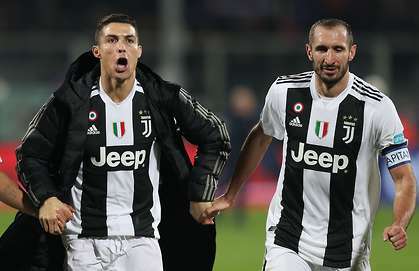 Chiellini believes Ronaldo is to football what 20-time grand slam winner Federer is to tennis and what eight-time Olympic champion, Bolt, is to athletics. And he enjoying learning from him in his quest to remain a worthy Juventus captain. “Replacing Buffon is not easy at all. As captain, you do not need to do the jobs of the others,” Chiellini told La Stampa. “But, you have to help maintain a balance and in a multi-cultural dressing room which includes many different backgrounds, habits and religions, it’s not always easy, but sharing that is beautiful. “You become a leader. I am a curious person, a good observer and I like learning. For example, having Ronaldo close to me is interesting. “He is like Bolt and Federer. Understanding the habits of those who have that extra gear helps. It is not to imitate him, but rather it helps to broaden my horizons.”.